I keep getting asked to take part in blogging competitions. You make up a virtual outfit and pitch your entry against a few hundred bloggers half your age and you don't win - so cynical in my old age! Anyway, I've avoided them to date but this one from Fashion Vouchers appealed to me as I was already planning a similar post myself - A Christmas Party Outfit for £100. Out of the 100's of brands Fashion Voucher list discounts for, I chose Oasis as they have 25% off lots of party stuff at the moment. It meant I could get shoes and bag for the price and left me with about £8 for the taxi home! Here's my outfit.. I picked items that I could work with in other ways in my wardrobe. While I love dresses, I find going out dresses get limited wear. But if you get some good separates, you can recycle them much easier - sometimes even in daytime. Here they are in more detail - you can click on any of the photos to see the item on the Oasis website. 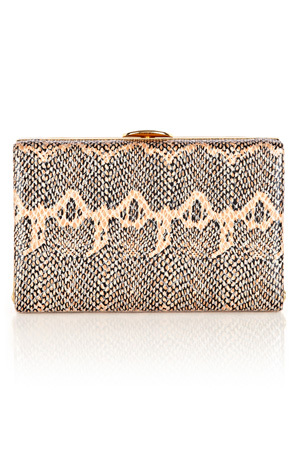 And finally, what's not to love about this clutch? On trend with it's snakeskin, the colour will work all year round and I'm thinking it would be great for a wedding too. With the 25% off I found on Fashion Voucher's website, the total bill (including delivery to Northern Ireland) is £92.49. But this discount is only valid until tomorrow night (30th November!) so get ordering! I should point out that this is not a sponsored post. I was not paid or induced to do the post but I might (ha!) win a prize if it's deemed utterly wonderful. Let's not lose any sleep wondering about that but instead look forward to my wonderful 1000 Facebook Fans/Christmas competition coming up on the blog in a day or so (sick kiddie dependent - I have two at home right now coughing their little heads off). Once I get some blogging time to myself, I'll fill you on on the gorgeous prizes up for grabs! Love, love, love this outfit! SO me! Love those shoes and that clutch bag. That's a really clever party outfit as everything, as you say, can be worn again. Did I mention that I love the shoes and clutch bag?! I feel like its so me, well except the shiny leggings but I love it all! That's scarily similar to an outfit I'm planning on wearing over the festive season. Great minds eh?! I agree about the separates. I have so many dresses that barely get a wear. Thank heavens for Dressember. 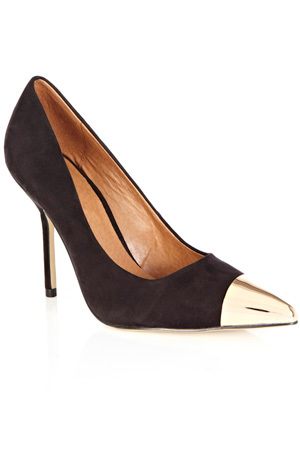 they are the best picks for the festive season ! love this look for a christmass party ive just bought a pair of faux leather leggings and plan to wear them plenty over the festive season. Did you you a pair? Nice look! Those leggings look amazing!! Do they really fit SO perfect? ?